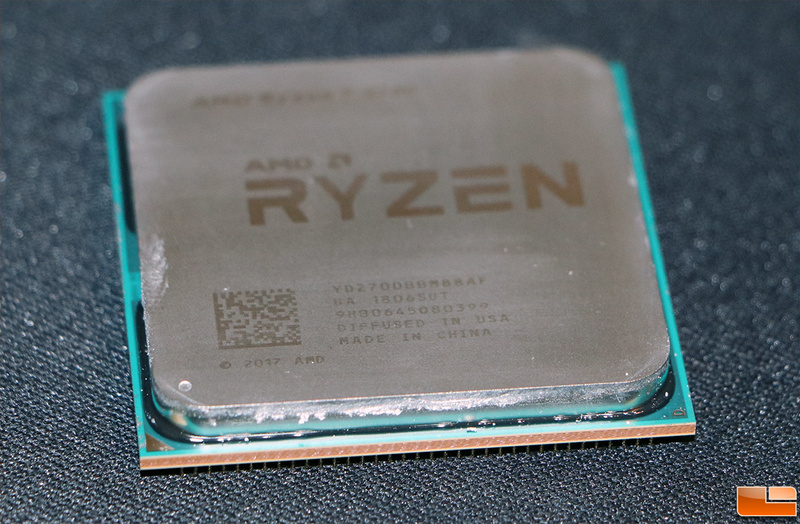 Last month we published reviews on the Ryzen 7 2700X and Ryzen 5 2600X processors and found AMD’s second-generation Zen models to be off to a great start. Both the models we looked at last month support AMD’s XFR 2 technology though and we weren’t able to look at the non-XFR (eXtended Frequency Range) models of the same processors. Today, we’ll be taking a look at the AMD Ryzen 7 2700 8-core, 16-thread processor that is basically the same thing as the Ryzen 2700X albeit with XFR technology disabled and lower clock speeds. Internally it uses the same Zen+ architecture and is fully unlocked, but thanks to the lower clock speeds the TDP has been reduced from 105 Watts on the 2700X down to just 65 Watts on the 2700. That is a huge drop and should appeal to small-form-factor enthusaists that are building in cases with limited airflow. A large number of cases and aftermarket CPU coolers support 65W processors, so building a system for a powerful 8-core processor shouldn’t be a big deal here in 2018. 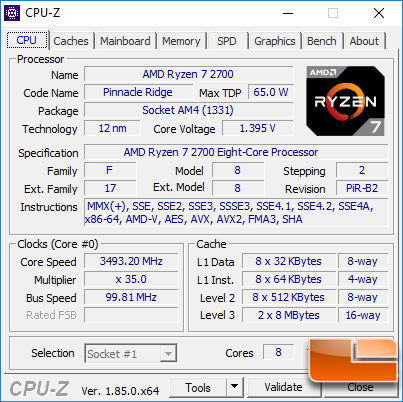 The AMD Ryzen 7 2700 has a base clock of 3.2 GHz and a boost clock of 4.1 GHz, which is 500 MHz lower on the base clock and 200 MHz lower on the boost clock that the flagship Ryzen 7 2700X. It will be interesting to see how such large clock differences impact benchmark performance. CPU-Z properly shows that the Ryzen 7 2700 is a 55W TDP 8-core, 16-thread processor with 768KB of total L1 cache, 4MB of total L2 cache and 16MB of total L3 cache. 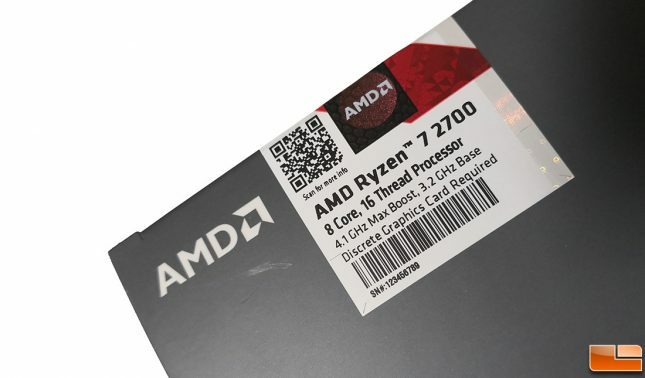 The AMD Ryzen 7 2700 processor we’ll be testing today is sold under part number YD2700 and comes with the Wraith Spire (with RGB LED) CPU Cooler. We’ll be testing this processor on the ASUS ROG Crosshair VII Hero (Wi-Fi) (X470 chipset) motherboard ($289.00 shipped) paired with G.Skill Sniper X series 16GB (2x8GB) DDR4 3400 desktop memory kit ($240.99 shipped). Before we move along to testing we should note that our AMD Ryzen 7 2700 processor was a retail boxed model provided to us by AMD for purposes of this review. We cut open the seal on the box ourselves and when we got the processor out of the box we noticed that our fingers had thermal paste on them. Our brand new Ryzen 7 processor already had thermal paste on it! Over the years we’ve seen folks talking about getting ‘used’ processors, so we contacted AMD. They informed us that someone at the factory must have not removed the thermal paste properly after factory testing. Then again the serial number on our box was 123456789 and the back of the label said not for resale, so hopefully we don’t have a cherry picked sample as it appears to have been pulled aside for reviewers. Let’s take look at the test system and look at some numbers!